Apple Cider Vinegar : The Miracle Product? Apple cider vinegar is made from fresh, crushed apples which are allowed to mature and ferment naturally in wooden barrels. Natural ACV is brown in color, usually has a cobweb-like substance floating in it and never needs to be refrigerated. It often has a very pungent odor and may even cause you pucker! These are all good signs of a natural ACV! That cobweb-like substance is called the “mother” and that is where all the benefits are found. You may have noticed over the last few years it has become harder to find natural ACV. Stores took some of them off their shelves because consumers buy based on looks and natural ACV is not all that appealing to the eye! They began to sell pasteurized, refined versions that lack ALL the health benefits! There are enough benefits of apple cider vinegar that I could write for days. I’ve broken down a list of the top 10 to get you started! 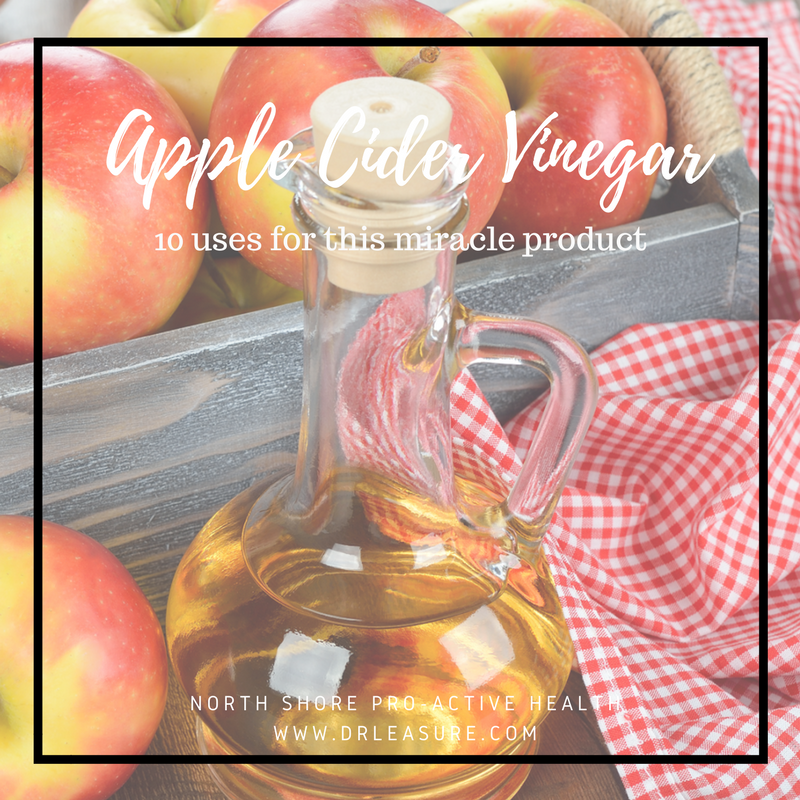 Remember that many of the health benefits cannot be found in distilled vinegar – it needs to be all natural Apple Cider Vinegar with the cobweb of goodness floating in it! Remove Teeth Stains: Rub your teeth with it an rinse! Detox Your Home: All natural cleanser. No need for harsh chemicals! Shiny Hair: Rinse after shampoo. It will boost your hairs shine and body. Mix 1/2 tablespoon with a cup of water and use a few times a week. Aid in Weight Loss: Drink 2tsp mixed with 16oz of water. Sip throughout the day. Balance your pH: Keeps your body more alkaline to decrease infections. Lymphatic Improvement: Helps break up mucous and cleanse lymph nodes. This may help with allergies as well! Take daily to ward off sore throats and colds. Reduce Heartburn: Take a tsp of ACV followed by a glass of water. You should feel relief shortly. Room Freshener: Pour directly into toilet and allow to sit overnight. It can also be used for kitchen surfaces, windows, glass and more! Mix 1/2c ACV with 1c water! Improve Skin: From psoriasis and eczema to dry skin and blemishes. It will help reduce inflammation and reduce symptoms. Just dab with a cotton ball. Decrease Glucose Levels: Studies show people with type-2 diabetes found that two tablespoons of ACV before bed lowered glucose in the morning by 4-6%! The one thing to remember is that ACV is acidic. You want to take small amounts if you are using on a daily basis. Taking small amounts should offer no risks whatsoever. It is beneficial to talk to your MD or DC prior to starting a new supplement regimen. If you have questions about apple cider vineger set up an appointment to see how it might be beneficial for you!